Children are requested to arrive at school by 8.50 am. School doors are open from 8.35am. The Board of Management accept no responsibility for pupils arriving before that time. Pupils should go to their designated playground until the bell rings at 8.50am, when their class teacher will collect them. Junior Infant pupils can go directly to their classrooms on arrival. On wet mornings, all pupils should go directly to their classrooms. Pupils will not be allowed to leave the school during the school day. If a child has to be collected early, the parent should go to the classroom and sign out their child. There is a fifteen minute break at 10.45am and a forty minute break at 12.30pm. Pupils are given time to eat their lunches at their desks before being allowed out to play. In general pupils are not allowed to remain indoors during playtime. Infant classes finish school at 1.45pm. Parents/guardians are invited to collect their children from their classrooms at this time. The staff of Ennis National School want to create a climate of physical, emotional, social, and intellectual safety for students, teachers and parents so that teaching and learning can occur within relationships of mutual valuing and respect. We want pupils to be self-motivated and to be at peace with themselves, others and the world. This requires the help and co-operation of pupils, teachers and parents. Parents/guardians can assist the school by encouraging their children to abide by the school rules, encouraging punctuality and regular attendance and by ensuring that homework is given due time and effort. The procedures to be followed in relation to a child’s absence from school. Should a parent/guardian be concerned about any aspect of their child’s behaviour they are welcome to make an appointment to discuss their concerns. As a general rule the school will endeavour to create an environment where positive behaviour is reinforced through praise and reward. 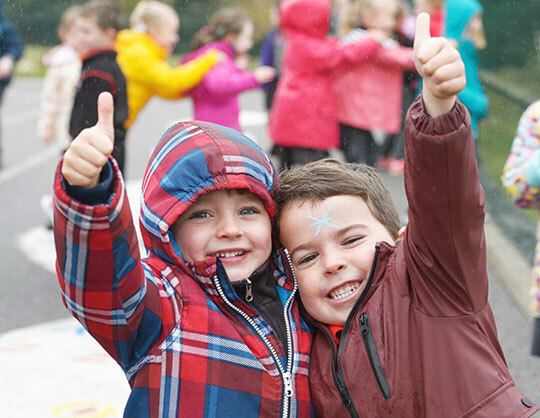 School staff will use encouraging language and gestures, both in class and around the school, so that positive behaviour is instantly recognised and positively rewarded. Special attention will be paid to pupils who have previously been associated with poor behaviour so that not only good behaviour but also improvement in behaviour is acknowledged. The school uniform is available from Pynes, Abbey Street, Ennis and McCannons, The Market, Ennis. Generic pinafores, pants, shirts and black tracksuit bottoms and shorts can be bought in department stores. School crests available from TM Office supplies, Parnell Street, Ennis. All uniform items should be labelled with the child’s name. Shirt and tie must be worn with the winter uniform under the grey school jumper and under the alternative option of the black half zip school sweatshirt. September to Halloween (Easter to End of School Year). This school supports the notion that eating healthy food is in the greater interest of all our pupils. Eating nutritious foods pro-motes good general health, aids fitness and improves their chances of listening and learning in our classrooms. It assists school and home in the important task of raising healthy, active, happy and well-balanced future adults. We have a policy of promoting healthy lunches. Cheese – triangles or diced. Fruit = Apples, oranges, kiwis, pears, plums, raisins, melon slices. Chewing Gum is not allowed at school. Positive home / school relationships are encouraged in order that we can work together for your child to fully benefit from all our school has to offer. Our ‘open door’ policy means that parents may see the Principal at any time but, for your convenience, it is helpful if you phone in advance to check availability. Parents may also see teachers before or after school with prior arrangement. Please check your child’s homework journal often and use the journal to send messages to the teacher. Parent-Teacher meetings will be organised in the first term, at which you will have an opportunity to formally meet your child’s class teacher. Circulars are issued to parents/guardians on a regular basis to update them on school events. Please keep an eye on your child’s school-bag for notes for parents. The Text-a-Parent service is used to notify parents by mobile phone of forthcoming school events and of school closings. The carpark closest to the school is for staff parking only. Parents with pupils in infant classes are welcome to use the public carpark. In the mornings, parents who do not have pupils in infant classes are requested to drop their children at the roundabout outside the school and not to enter the carpark. At all times, please park with consideration for others. Ennis National School organises a ‘Walking Bus’ each morning at 8.30am from Curleys’ car-park. Staff and parents walk children from there to the school arriving by 8.45am daily. We wish to encourage car pools. A car pool or car sharing is when two or more people travel together in one car, instead of separately. If one parent drives pupils to school one day another parent will drive the next day – sharing the job! The school bus service leaves from Drumbiggle each morning at 8.30am. The bus also does two evening runs, at 1.45pm for pupils in infant classes and 2.45pm for pupils in other classes. Places on the bus must be booked in advance through the school principal. We are very conscious in the school of collecting money for various items. For convenience, we have included a number of items with the Parents’ Contribution which covers payment for Personal Accident Insurance, Homework Journal, Art and Craft materials, Photocopying, School resources and Text a Parent service. The sum of the contribution is €50 per pupil as indicated on school booklists, with a maximum of €150 per family. We would appreciate it if Parent Contributions were paid annually before the Halloween Break. If paying by cheque, please make payable to ‘Ennis National School’.